Posted on April 11, 2014 by Worth Stopping By . . . I rely on the site allrecipes.com all of the time. I can search by ingredient, type of dish, and dietary restrictions. I also love the fact that you can adjust the recipe according to the number of servings that you want. 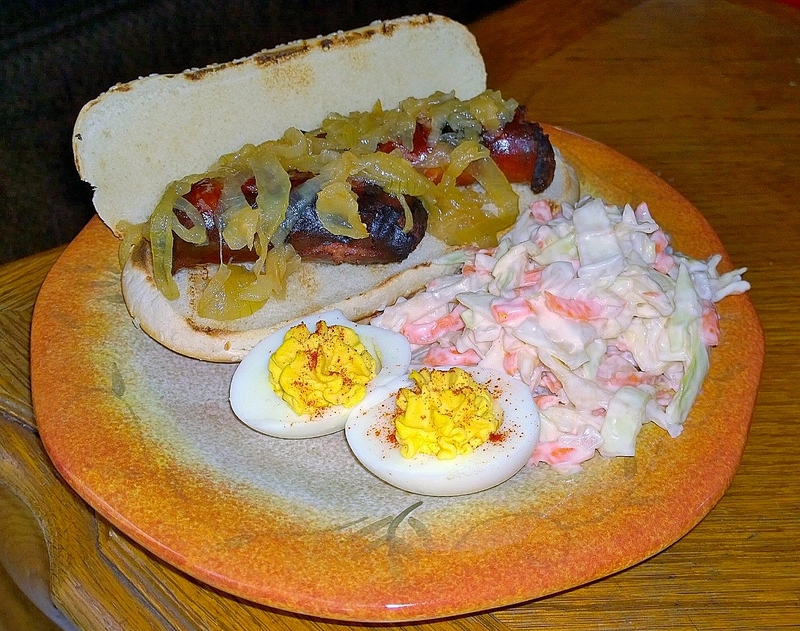 I saved a boiled egg from the deviled eggs I prepared earlier in the week, and I’m sure you recognize the Beer Simmered Grilled Sausage. This sandwich is a little bit different, and my guys weren’t sure they were going to like it at all. Surprise!! — It’s a big hit. Don’t skimp on the spread. Apparently, that is what holds it all together – both from a flavor standpoint and a structural standpoint. 1. In a small bowl, stir together the cream cheese, butter and garlic. Spread some of this onto each slice of bread. 2. Reheat the sausage. 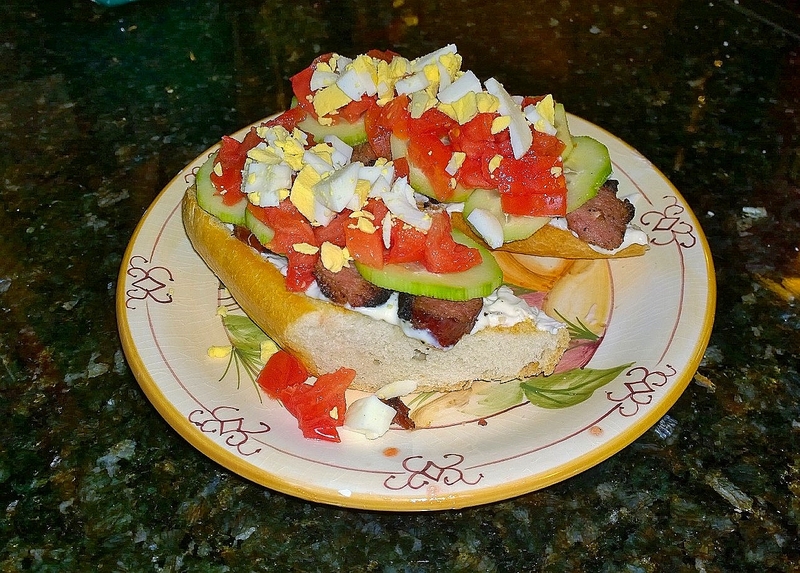 Place the slices of sausage, cucumber, and tomato onto each piece of bread, then top each one with some chopped egg. Serve open-faced. Posted on April 8, 2014 by Worth Stopping By . . .
My family loves pork — sausage, chops, ham, bacon — pretty much anything. I guess when you live in the Carolinas that is to be expected. This recipe (found on epicurious.com) is really for raw link sausages. However, I modified it to use kielbasa with great success. I love to keep sautéed or caramelized onions on hand, so this recipe was a double bonus for me. I make coleslaw exactly the way my mother did when I was young: chopped cabbage, chopped onion, shredded carrot, and Miracle Whip. It is not a very sophisticated recipe, and one that uses a processed salad dressing, but it does the trick. 1. Prick each sausage a half-dozen times with a needle or pin stuck in a cork. 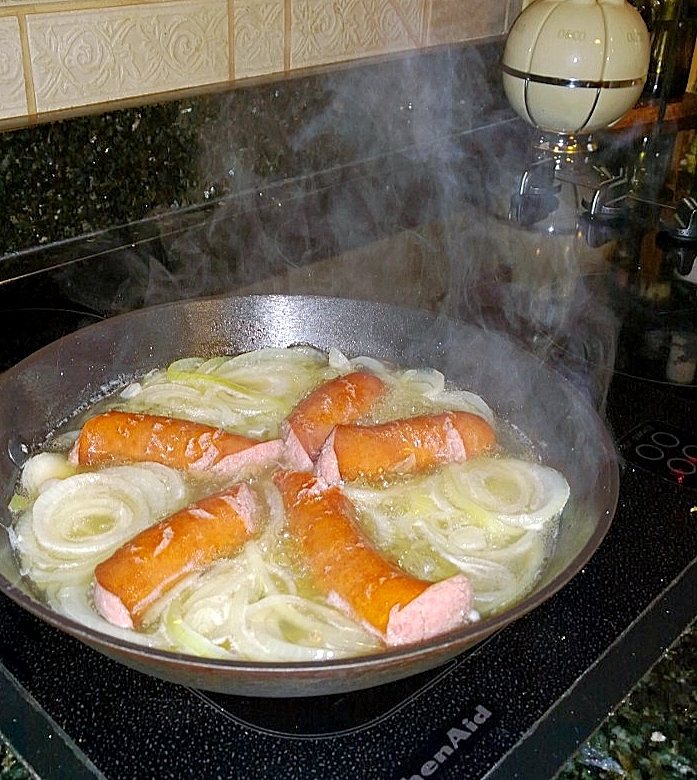 Arrange the onion slices on the bottom of a sauté pan just large enough to hold all the sausages. Place the sausages on top and add beer and water to cover (the ratio should be about 3 parts beer to 1 part water). Place the pan over medium heat and gradually bring the liquid to a simmer, not a rapid boil. Poach the sausages until half-cooked, 4 to 5 minutes. Remove the sausages and allow to drain. Continue to cook the onions and beer down until the beer is reduced and onions are soft and slightly browned. 3. When ready to cook, brush and oil the grill grate. Lightly brush the sausages on all sides with oil and place on the hot grate. Grill until the casings are crisp and nicely browned and the sausages are cooked through, 4 to 6 minutes per side.